Quebec provincial police have found the crash site of a helicopter that went missing in the Laurentians, north of Montreal, but are not commenting on where it was found, or if the pilot has been found. Quebec provincial police have found the crash site of a helicopter that went missing in the Laurentians, north of Montreal, but are not commenting on where it was found, or if the the pilot has been found. The pilot, a man in his 50s from Rouyn-Noranda, Que., left that city around 10:30 a.m. ET Monday. The helicopter was expected to arrive at Mirabel around 1 p.m., but never did. The man's former flight instructor called police and Nav Canada around 4:30 p.m. after he failed to show up at his destination. Provincial police Sgt. 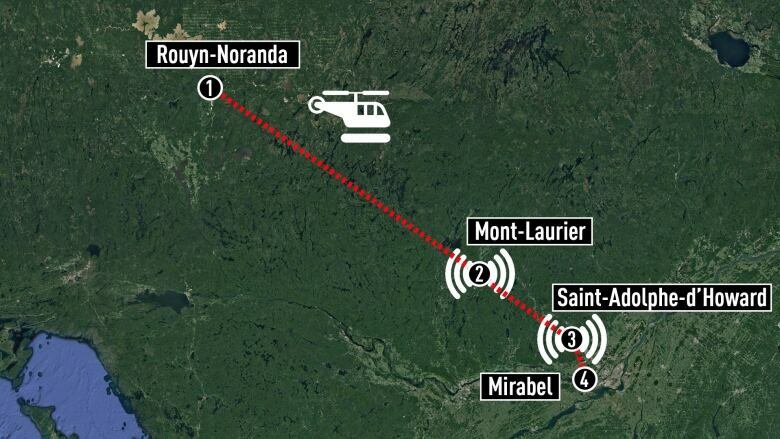 Stéphane Tremblay said the pilot was last heard from around noon, while flying over the Mont-Laurier area, about 325 kilometres away from Rouyn-Noranda, as the crow flies. The pilot, who was alone on the helicopter, has about 100 hours of flying experience, Tremblay said. His cellphone was traced to an area near Saint-Adolphe-d'Howard, 50 kilometres north of Mirabel. That is where search efforts were centred. Police were on the ground in cars and all-terrain vehicles near Lac Saint-Joseph, a lake in Saint-Adolphe-d'Howard. Helicopters belonging to the Department of National Defence and police have been involved in searching the area.